John David Anderson dropped by to chat with me about the cover illustration for Ms. Bixby's Last Day, pizza, Mr. Holland's Opus, and cheesecake. (What a variety of topics, eh?) I wrote the words in orange, and he wrote the words in black. Thank you, John! 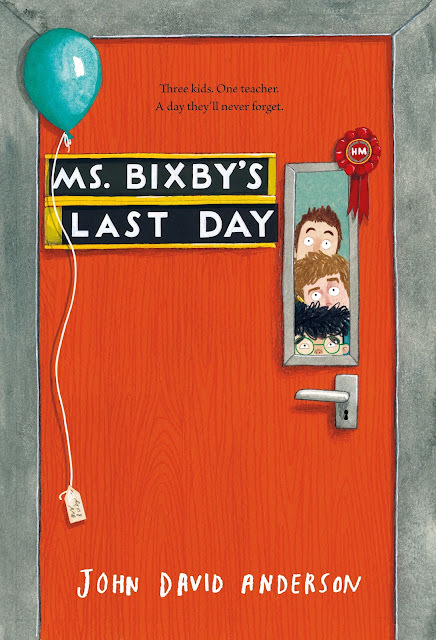 The cover illustration for Ms. Bixby's Last Day is wonderfully mysterious. What are the boys looking at? Or for? Who is Ms. Bixby? Why is it her last day? Is that balloon about to pop? Why does John David Anderson not just call himself J.D. Anderson, which would be much cooler? (He didn’t think he could pull it off.) The thing I like best about it are the three boys stacked one on top of the other. 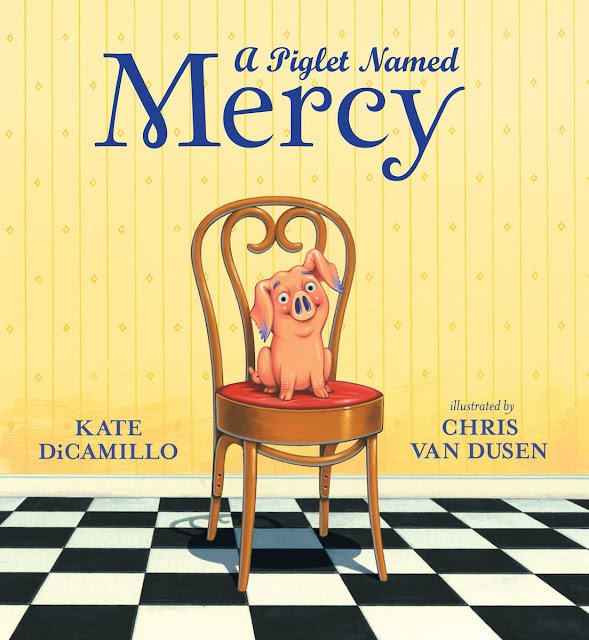 They all take turns narrating the story, and each brings a different take on Ms. Bixby. But it’s also the story of their relationships with each other, which are tested in their own way. I think the cover speaks to that. Ms. Bixby's Last Day tells the story of three boys and their epic quest to give their teacher the last day she deserves, even if it means skipping school, acquiring rare and illusive treasures, battling cash-snatching thieves, hiding from over-protective sisters, confronting mysterious and creepy booksellers, and giving each other a hard time. It’s a journey that tests their friendship and reveals, through each boy’s perspective, the impact one teacher can have. It’s like Stand By Me, Mr. Holland’s Opus, and the Holy Grail myth all rolled into one. With more humor. And french fries. Explore John David Anderson's website. On June 21, 2016, people all across the country will probably order pizza for dinner. I feel safe saying this. Also I will probably see/hear 85 messages telling me who I should vote for for President. Oh, and I will be fortunate enough to see my fourth book with Walden Pond Press hit the shelves. Anyone who forgoes ordering pizza and buys a copy of Ms. Bixby’s Last Day instead will be treated (I hope) to a hilarious, yet poignant coming-of-age story that will be sure to make them go out and eat cheesecake. Which is probably better than eating pizza (it’s really not), and is certainly better than eating my book (though I hope readers devour it anyway). Walden Pond Press is the best boss I could ever hope to have. The people who work there—who helped me nurture Bixby from its infancy and shape it into something I’m heart-breakingly proud of—love what they do and have made it their mission to get good books into the hands of eager readers. That’s a noble quest, I think, and I’m just thankful to be a part of it. And because that’s a cheesy way to end an interview, I’m also thankful for pizza. And cheesecake. Which, I suppose, is a doubly cheesy way to end. 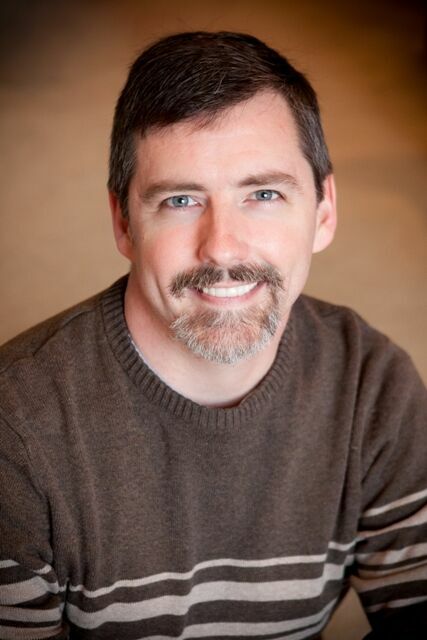 John David Anderson is the author of Sidekicked and Minion. A dedicated root beer connoisseur and chocolate fiend, he lives with his wife, two kids, and perpetually whiny cat in Indianapolis, Indiana.